The main point of this game is to hit your opponents as much as you can! At the same time you must avoid being hit and losing your health points! Get ready to bash into your opponents and have some fun! First you must chose which car you want to be. The keys you will use to move your car will depend on what car you chose. Car 1 uses the arrow keys. The up arrow will make the car go forward, the down key makes the car go backwards, right arrow will make you move right, left will make you move left. For car 2, the S key is forward, A key is backwards, Q is left, and Z is right. For car 3, the F key is forward, the V key is backwards, the B key is right, and the C key is left. For car 4, the I key is forward, the K key is backwards, the L key is right, and the J key is left. To move left or right you must be going forward or backward at the same time. You can play this with 3 other people, using the same keyboard. However, no neopoints will be awarded when you play with others. The picture below shows which cars go with which number. Using the keys indicated for the car you chose, try hitting the other cars as much as possible, while avoiding being hit by the other cars. You will see a green plus sign when you hit a car, each time you hit a car you get five points. When you are hit by a car you will see a red X. When you are hit your health goes down. Power Ups randomly appear on the game screen during your game play. There are five power ups in the game. The invincible power up gives you the ability to be hit by other cars and lose no health points, when you have this power up your car will have a green glow around it. The death power up is a grarrl, this power up isn't much of a power up at all, this one will simply kill you. It will end the game for you immediately if you are playing in single player mode. If it attacks another car then they are out of the game for that level. 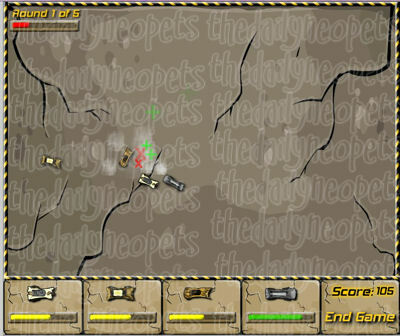 In the multiplayer mode the level will end as soon as any car is attacked by the grarrl. The slide power up will make you slide around! This power up also removes the yellow and black bar around the game play area, so you can exit one side of the game area and enter on the opposite side. The health power up will restore you health! Lastly, the turbo power up will gives you a speed boost! This power up also removes the yellow and black bar around the game play area. Collecting as many power ups as you can will help you out in the game. Remember the grarrl isn't a good power up! Avoid him at all costs! Invincibility is one of the best power ups to use. Using this power up can get you many points without harming yourself in the process! The health power up is also a great power up in this game. Restoring your health gives you more chances to hit your opponents without dying. The slide power up and turbo power up are difficult to control when you are just learning the game. It takes a lot of practice to get the feel of these power ups and to be able to control them. Once you have them figured out they can be very helpful as well, giving you more chances to hit your opponent. When you are hitting your opponents pay attention to the other cars, you can be blocked in while hitting one opponent, causing yourself to be hit while you are hitting the other car. The screenie below gives and example of this kind of situation. If you are trying to obtain a higher score, try to rack more points in the very first level of the game. It's possible to score around 300 points in the first level if you are lucky. A good strategy to do so is to wait until two or more cars are near the wall and to bump them as if there was no tomorrow. If you get caught in a corner, remember that you can go backward and damage your opponents that way too. Practice makes perfect! This game is a perfect example of that, just keep practicing and you will improve. Getting a feel for the controls and for the power ups can greatly improve your score in this game. Remember to watch you opponents and avoid the grarrl! This game can be a great stress reliever! Who doesn't find bashing into other cars fun!